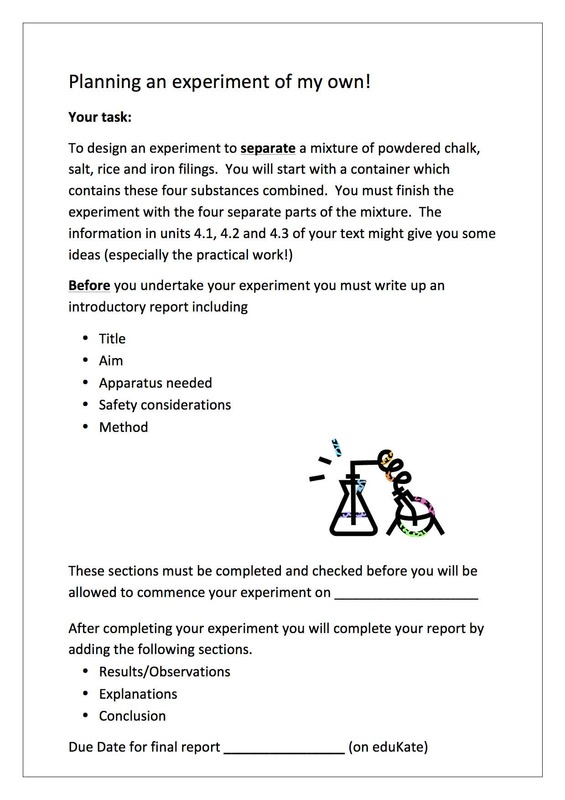 This artefact demonstrates my initiatives to utilise a summative science experiment coupled with a written report task to assess student learning during a unit on Separation of Mixtures and gather quantitative data to be used for reporting purposes. I have consistently used assessment AS and FOR learning to improve learning outcomes, inform my teaching and provide feedback on learning. I often utilise self and peer assessment strategies and strive to provide whole class as well as individual (written and verbal) feedback. I am steadily developing my summative assessment practice – developing rubrics, marking tests, conducting running records. During 2014, I worked collaboratively with my university colleague Olivia Sonn and broader communities – Methodist Ladies' College (MLC) and Victoria University (VU) (VIT Standard 6 & 7 – professional learning and engagement), to investigate teachers’ and students’ involvement in the cultivation of global citizenship qualities, more specifically in the development of awareness, appreciation, understanding and responsibility. It is early August, 8:30am. At the Methodist Ladies' College a long queue of young scientists, from all across Victoria, are braving the cold in anticipation to impress the judges with their scientific models and inventions. Calm before the storm – the judging day of the 64th annual Science Talent Search competition has finally arrived – I am observing, going over the extensive assessment rubrics for the very last time before the judging begins. I am excited and a little nervous; it’s been a year since I have done this for the first time. This year’s theme: ‘Science of Light’ – I can’t wait to see what the children have been busy inventing and building in their spare time. I was teaching Year 10 Applied Science class of 14 girls with a range of social and intellectual disabilities, modified content and instructions. After having spent a better part of the week talking about chromosomes and karyotypes and about the differences between these in males and females, healthy and abnormal types, I needed to know if we can move on. I thought building a karyotype and reading it to answer a series of related questions would be a great way to individually assess my student’s understanding of the topic (I was looking to gather some quantitative evidence of learning, to inform the quality of my teaching and future planning) whilst engaging them in a fun, hands on, cut and paste activity to which I allocated an entire period. I modified the content and gave my students clear instructions on what to do. Will is a 13 year old kid who attends Grade 7 at a local secondary school in a small, low socioeconomic town in rural Victoria. His literacy and numeracy skills are very low, he is on a behavioural management plan and is marked ‘at risk from disengagement’ by the school.